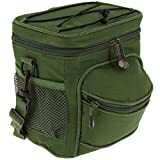 The XPR cooler bag is a stylish insulted bag that is designed for carrying food. Additional front storage compartment and two side mesh compartments. Features also include twin zips, webbing on the top and a detachable carry strap. This entry was posted in Carp Baits and tagged 21.5, bait, Boilies, Carp, Cooler, Deadbaits, Food, Green, Insulated, pike, Unisex. Bookmark the permalink.